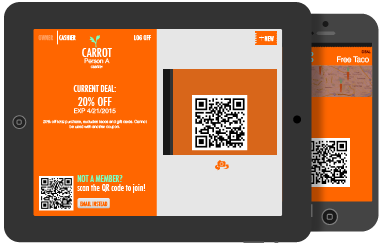 Capture new customers and create loyal ones with CARROT, America's best Fitness Rewards program! For businesses looking for new customers, there’s no program quite like CARROT. Thousands of shoppers have downloaded the free CARROT Wellness app, earning one Reward Point for each step they take. Now they’re looking to redeem those points at great local businesses – be one of them! And with CARROT iBeacons, you can remind nearby shoppers of your great offers by placing messages directly on their lock screens. More importantly, offering rewards for healthy behaviors sends a strong message about how you value your customers. More revenue is right outside your door – just dangle a CARROT! use our 3 step Maker to create passes fast! CARROT Beacons (one-time charge) give nearby shoppers a “gentle tap”, putting your offers directly on their lock screens (and giving you great analytics). Redeeming the shopper’s digital coupon is easy. Simply scan the custom-generated code on their phone using a smart phone or tablet.